How do you identify the components within your virtual environment? You give them names right?! Well to programmatically identify the same components that’s exactly what VMware does but rather than names they give them IDs and guess what, there are a lot of different IDs, so many that people often get mistaken by which ID to use in which circumstances and what they refer to. After a discussion with one of VMware’s brightest engineers (Thanks Jeff Hu) and a long email thread where he dumped his brains on what these IDs were for, I thought I would blog them and make use of this awesome information. 1. 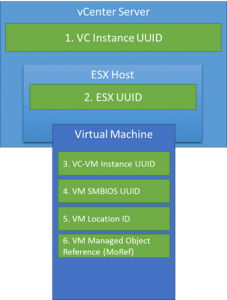 VC Instance UUID (aka serverGuid): This is a GUID that identifies the vCenter server. This is accessible from the AboutInfo property in the VIM API. The property name is AboutInfo#instanceUuid. It’s set at install time and is persisted so the value is durable for a given VC instance. PS C:\> $vcenter = Connect-viserver vcsa-01a.corp.local -User [email protected] -Password VMware1! 2. The ESX Host UUID is read by the ESX host from the System Management BIOS (SMBIOS). This UUID is not generated by VMware, it is unique to the hardware and is set in the BIOS by the vendor. 3. VC-VM Instance UUID: This is the vc.uuid property in the VM vmx configuration file and also the instanceUuid property on the VmConfigInfo for a VirtualMachine in the VIM API. This UUID is used by vCenter to uniquely identify VMs that it is managed. vCenter assigns this UUID to the VM after it is created. There are different workflows where a VM may not have a UUID initially or may have a duplicate. vCenter actively looks over the VM inventory and will automatically patch the VM instance UUID if it sees a duplicate. 4. VM SMBIOS UUID: This is the uuid.bios property in the VM vmx configuration file. In the VIM API, this is the uuid property on the VmConfigInfo for a VirtualMachine managed object. This UUID is visible to the guest OS as the SMBIOS UUID. VMware generally try to avoid changing this UUID since it is often used by applications that manage the guest OS instances. When the VM is migrated this UUID is maintained. 5. VM Location ID: This identifier is stored in the VM configuration file as the variable uuid.location. In the VIM API, the name is locationId also on the VmConfigInfo of the VirtualMachine. This is one other detail that might be relevant to a 3rd party solution that might be moving the VM without vCenter’s knowledge. This property is used in conjunction with the VM SMBIOS UUID. This property is a hash of the VM’s configuration file and some UUID of the ESXi. The purpose of this UUID is to detect out-of-band migrations and copies of the VM. If vSphere (or Workstation/Fusion) detect that the locationId is no longer valid, it will pop up dialog/question/error asking the user why the locationId is no longer valid. The user is prompted to answer whether the VM was moved or copied. 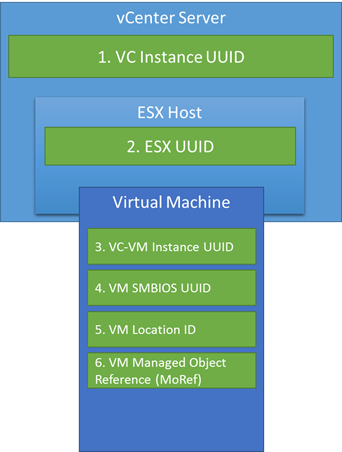 The purpose is so that vSphere can determine whether it should keep the existing the SMBIOS UUID or generate a new one. 6. VM MoRef: The VM MoRef is a short key used by a vCenter instance to identify the VM. This is the primary identifier used by the VIM API to refer to the VM. The other identifiers can generally be used to find the VM, but the VM MoRef is the one that must ultimately be used to get data and issue operations to modify the VM. A lot of Information and different IDs I know but hopefully this will help you identify which to use and when so that you can get the most out of your Virtual Infrastructure! vSphere Replication was introduced with vSphere 5.0 and SRM 5.0 providing a way for customers without the ability to leverage storage array replication to utilize Site Recovery Manager (SRM) within their environments as their disaster recovery solution. With the release of vSphere 5.1 vSphere Replication also became available as a standalone replication solution included with Essentials Plus and higher vSphere license editions. Customers now have the option of deploy vSphere Replication on its own to provide basic per-VM replication for use cases where SRM’s advanced DR orchestration capabilities were not applicable. 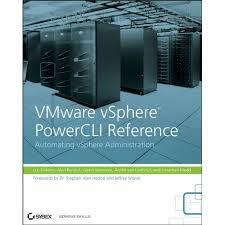 As adoption of vSphere Replication is growing amongst the vSphere 5.1 customer base so has the number of requests for ideas, hints and tips on what kind of reporting could be added to provide usage information for the various events that could occur amongst a collection of replicated VM’s. The number of customers asking for this kind of information led to this blog being written and the scripts being created in conjunction with Lee Dilworth who is a Principal Systems Engineer with VMware and SRM expert.